Facebook is planning to offer you the popular Snapchat feature in its Messenger app – 'Self-Destructing' Messages. Yes, Facebook is testing a new feature within its Messenger app that will allow its users to send self-destructing messages. Some Facebook users in France have spotted this new feature in the Messenger app that lets them send messages that only last for an hour. How to Turn ON the Feature? Users can turn on the self-destructing message feature within Messenger through an hourglass icon on the top-right corner of the conversation. The icon, when tapped, sets the messages to self-destruct after an hour of sending it. Tapping the hourglass icon again will turn off the feature, with everything going back to normal. "We're excited to announce the latest in an engaging line of optional product features geared towards making Messenger the best way to communicate with the people that matter most." "Starting today, we're conducting a small test in France of a feature that allows people to send messages that disappear an hour after they're sent. Disappearing messages gives people another fun option to choose from when they communicate on Messenger. We look forward to hearing people's feedback as they give it a try." Snapchat has been offering similar feature since 2011 that allows its users to send images that self-destruct itself. This is not the very first time Facebook has experimented with the self-destructing message feature. Last year, the social network giant tested a similar feature with Slingshot, a standalone app that allows users to send self-destructing messages, but it didn’t work. 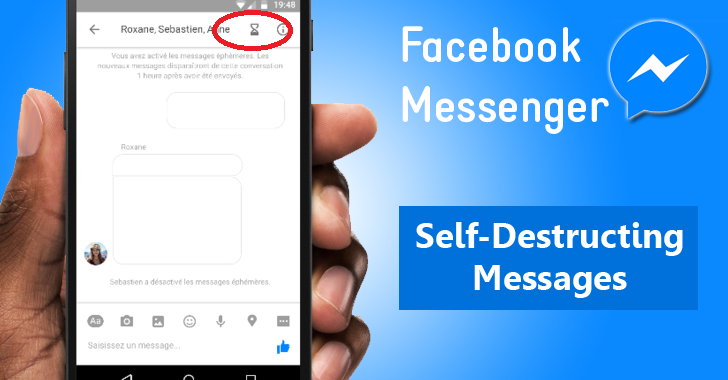 Hopefully, by integrating self-destructing messages in its Messenger app with 700 Million users already, the company gets success this time. So far the feature is only available to some users in France, but Facebook may roll out the feature outside of France if it's successful. What do you think of this new feature? Hit the comments below.